Ulster Architectural Heritage has an established reputation as one of the most prolific publishers of books on historic buildings in Northern Ireland, and across the nine counties of Ulster. Books published by Ulster Architectural Heritage have appeared steadily since 1968. With over 50 books published to date. UAHS publications are used by academics, historians, architects and planners, and are widely collected as an invaluable resource on local history and buildings past and present. Our publications range from general books on local architecture to monographs on particular architects or houses. 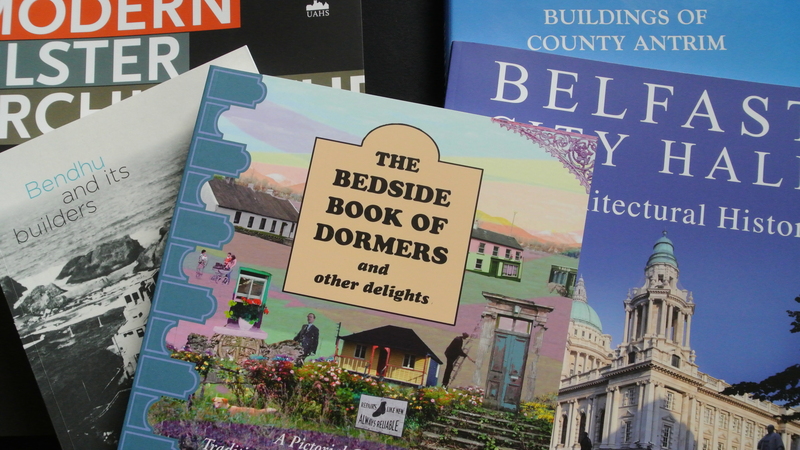 At the core are the historical gazetteers that describe nearly every building in many of Ulster’s towns with detailed descriptions and histories illuminated by anecdotes and numerous photographs. Other series focus on the architects of Ulster or a particular time period in Ulster’s architectural history. Ulster Architectural Heritage publications are available to purchase directly from UAH online, and are also available in good bookshops. ‘Beside Book of Dormers and Other Delights’, by Marcus Patton, 2011.